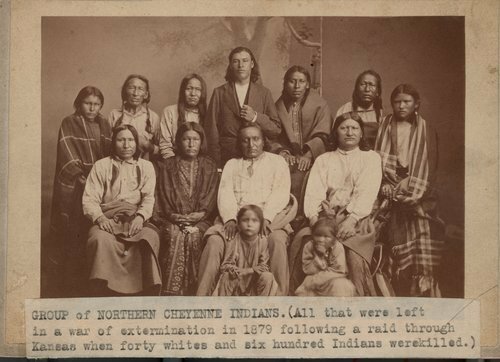 This photograph shows a group of Northern Cheyenne Indians. The original photograph does not identify the people. However, an article "The Kansas Indian Claims Commission" by Ramon Powers, published in Kansas History, Autumn, 1984, has the following identification: front row (left to right): Wild Hog's two children; second row: Porcupine, Crow's wife (? ), Crow, Wild Hog; top row: Crow's daughter (? ), Old Man, Left Hand, unidentified, Blacksmith, Frizzle Head, and Crow's daughter. The photograph was taken in Lawrence, Kansas.